A-true's motto is "a true lady, a true moment." How cute and catchy is that? First of all, yay! A-true is cruelty-free company so they do not test on cute little bunnies! So.. what is exactly is a cleansing water? I believe this product has the same purpose as mi-cellar water. 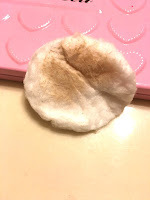 Which is basically a cleanser and makeup remover in one. It claims to be a one step cleanser and that you don't even have to rinse with water! That makes sense because it is technically water, but BETTER. Why is it better? Before I used the product, I looked into their ingredients and I am EXTREMELY impressed! Not only is it free of parbens, ethanol, and mineral oil. It contains vitamins and minerals for your skin! like... whatttt? This is THE REASON why I love k-beauty. The products are always taking it to the next step. I am so excited about this! The bottle holds 300mL of the product and you only need a little bit of it which is really great! To use this product, you will need to soak half a cotton ball and apply by wiping it all over your face. The smell is very mild and it is barely even noticeable. But if I were to describe it, it is a light floral scent with bits of citrus in it. I use a bb-cream on the daily and foundations on weekends or special events. This water did an AMAZING job. I was extremely surprised because I washed my face with water a couple hours before and this is what was left over. With just a few wipes, my face was clean and clear of makeup. My skin felt very soft and clean afterwards.